I am contacting you regarding an issue that is receiving increasing awareness amongst communities around the world; domestic abuse and violence as a human rights violation and a State’s obligation to protect under the principle of due diligence, as establish by the Inter-American Commission on Human Rights, Gonzales vs. USA and Velasquez vs. Honduras, and the European Courts of Human Rights in A vs. UK. Decreasing the prevalence of violence against women requires challenging its acceptance, especially the many ways in which victims/survivors are blamed and perpetrators excused, transforming the diverse cultures of complicity and impunity across the globe. The failure of justice systems across the globe to effectively charge, investigate and prosecute human rights violations against women and girls has resulted in a system of global impunity for perpetrators, which must be urgently addressed. The enormity of the problem and its detrimental effects on societies around the world are of epic proportions, and can no longer be considered “private matters” or “civil disputes” by law enforcement officials, judicial tribunals, or government and non-government agencies. As my own case and research demonstrates, until and unless judicial actors are held accountable for their failure to execute their duties and obligations as provided for under the law, progressive laws, government promises, and millions of dollars spent on awareness and action campaigns will be totally ineffective in eradicating domestic abuse and violence. The US government and US State Department are continually espousing their commitment to combating and ending violence and discrimination against women, promoting democratic principles worldwide, and protecting human rights and labor rights around the world. [i] [ii] However, when it comes to American women living overseas and the US State Department, Consular Affairs Division’s day-to-day operations, the rhetoric does not translate into reality. As so many advocates, I have become aware of and involved in the issues due to my own personal experience as a victim of domestic abuse, and re-victimization by the very judicial systems (in Spain) which have a duty and obligation under international human rights law to protect me and my children. The US State Department estimates that 5.25 million Americans reside abroad, with 650,000 women and children at risk of becoming victims of domestic abuse and violence. 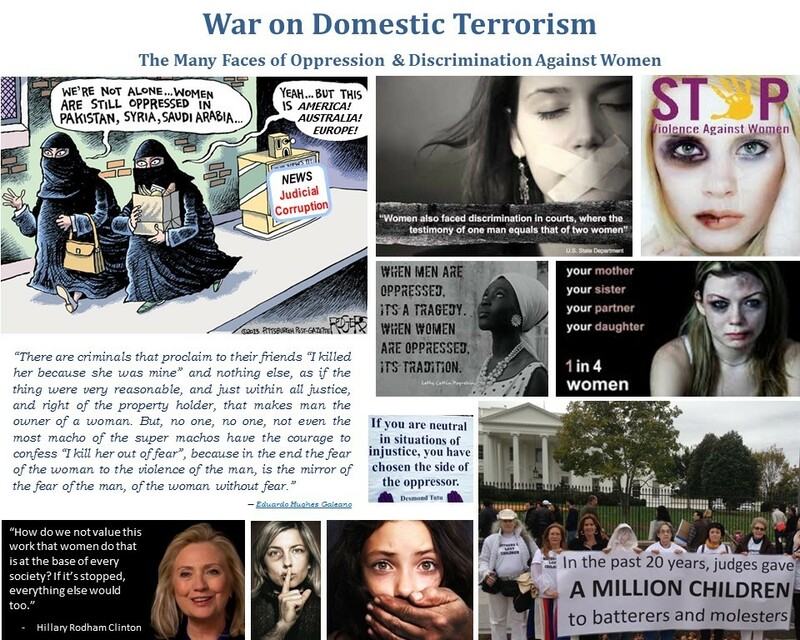 In 2012 the American Overseas Domestic Violence Crisis Center (AODVC – www.866uswomen.org) handled 3005 crisis calls, emails & live chats directly from, or on behalf of 547 victims (544 females, 3 males) in 57 countries (UK, Canada, Costa Rica, Turkey, Russia, UAE, Germany, Pakistan, Switzerland, Croatia, being the most frequent.) Ninety-nine of these cases were affected by the Hague Convention on International Child Abduction, which represents 29% of incoming Hague abduction cases handled by the Office of Child’s Issues of the US State Department in 2012. At year-end of 2012 AODVC was handling 124 on-going cases. As reported by the Hague Convention Domestic Violence Project (www.haguedv.org/reports) 70% of women involved in international child abduction cases under the Hague Convention are fleeing domestic abuse and the failure of judicial systems to protect them and their children. Abbott vs. Abbott (2010) (www.supremecourt.gov/opinions/09pdf/08-645.pdf) brought these issues to the attention of the US Supreme Court. Between 2010-2012 the Office of Child’s Issues, Consular Division of the US State Department handled 890 incoming Hague Convention on international child abduction cases, with up to 70%, or 623 cases, potentially involving a protective parent fleeing domestic abuse and a Receiving State’s failure to protect. While I have been unable to obtain figures from the US State Department on the annual budget for the Office of Child’s Issues, the 2012 budget for “Strengthening Consular and Management Capabilities” was $3.75 billion. Effectively, millions of dollars per year of the Consular Affairs Division’s budget are used in supporting the on-going abuse of thousands of Americans, while none of their resources are being used to assist the victims. Abusers are well aware of the criminal implications, the stringent sanctions, and incarceration of those who resort to international child abduction, and are freely and frequently using the Hague Convention as a tool to intimidate and abuse their victims. They do so knowing full well that victims will not be assisted by Receiving State’s judicial and law enforcement systems, nor will they be assisted by Sending State’s Consulates, consular affairs division in Sending State’s headquarters, or Sending State’s judicial system, which are plagued by the same “failure to protect” due to the same “lack of diligence” as in the Receiving State. In my own my ex-husband repeatedly assure me from the onset that I would be left penniless and incarcerated (prison or psychiatric facility); claiming that all “had been planned.” At the time, I thought his contention was just another example of his schizophrenic, hallucinatory state. But, statistics and documented testimonies show that this is an increasing phenomenon amongst victims of domestic abuse. In my own case all of my assets were illegally misappropriated by the courts and the negligence of my legal counsel, with my incarceration a very real possibility on several occasions. The culture of “laissez faire” and silencing of victims, apathy of law enforcement and judicial actors towards the plight of victims, failure of judicial regulatory agencies to diligently investigate complaints & sanction infractions of judicial actors, coupled with consular affairs representatives’ non-compliance with art. 5, 36, 37 & 38 of the Convention on Consular Relations and FAM guidelines (victims of crimes/domestic abuse), inter alia, provide the motive, opportunity, and means for abusers to utilize judicial systems and government institutions to freely and overtly continue abusing and harassing their victims. Of additional importance for the US government and US State Department, as my particular case demonstrates, is how American entrepreneurs in their business dealings abroad are open to corruption and discrimination in foreign courts. And, how the lack of due diligence by, and apathy of, US State Department officials permit unfair trade practices and misappropriation of American assets by foreign courts. As the American Consulate in Madrid has been aware from the beginning of my case, the escalation of violence and threats upon my life by my ex-husband’s were caused by my desire and efforts to provide financial independence for me and my children. My company, Global Expats (www.global-xpats.com) is modeled after the Federation of American Women’s Clubs Overseas (FAWCO), but is a revenue-generating entity which remunerates its trailing spouse managers and employees, as well as assistants them in career maintenance and entrepreneurial efforts. Revenues are generated from a networking/local search-city guide global website with estimate lost opportunity costs at $200 million to date. The disinterest and negligence of the American Consulate in Madrid and US State Department, Office of American Citizen Services and Crisis Management in Washington, DC, in the past 6 years and in regard to my case, has not only been responsibility for millions of dollars in lost revenues of my company, but prevented the creation of hundreds of jobs of American women living abroad. International organizations such as the IMF, World Bank, and United Nations are increasingly examining the link between corruption and the present economic crisis. My case provided a perfect case-study on how and why widespread corruption in the courts impedes economic growth and entrepreneurial development, and the role negligent governance by regulatory agencies is playing in promoting judicial corruption. In order to effectively protect and promote the interests of Americans living abroad, it is imperative that American Embassies and Consulates abroad comply with the guidelines in U.S. Department of State Foreign Affairs Manual Volume 7 – Consular Affairs (FAM), and utilize their prerogatives provided for in art. 5, 36, 37 & 38 of the Convention of Consular Affairs, and other international treaties, in assuring due process and respect for the rights of American citizens in foreign jurisdictions. I hope by bringing these issues to your attention the US State Department will reassess their policy of non-compliance with FAM, the Convention on Consular Affairs, and other international treaties which provide them with the power and authority to promote and defend the interests and rights of Americans living abroad. I thank you in advance for your time and consideration. Please feel free to contact me at Quenby@global-xpats.com or (202) 213-4911 with any questions or requests for additional information. “Good Practices in Combating and Eliminating Violence Against Women” Expert Group Meeting Organized by: United Nations Division for the Advancement of Women in collaboration with United Nations Office on Drugs and Crime 17 to 20 May 2005 Vienna, Austria, p.4. “Good Practices in Combating and Eliminating Violence Against Women” Expert Group Meeting Organized by: United Nations Division for the Advancement of Women in collaboration with United Nations Office on Drugs and Crime 17 to 20 May 2005 Vienna, Austria, p 12. “Good Practices in Combating and Eliminating Violence Against Women” Expert Group Meeting Organized by: United Nations Division for the Advancement of Women in collaboration with United Nations Office on Drugs and Crime 17 to 20 May 2005 Vienna, Austria, p.3. Extrapolated from estimates in Women and Health: Today’s Evidence Tomorrow’s Agenda, World Health Organization 2009, p. 56. The traditions and customs that for centuries have been used to silence dissent against government abuses of power are being used to silence the dissent of women and children who defy and denounce the abuses of power within the home. The importance of the role that government agencies play in assuring transparency, integrity and accountability of the industry it regulates is clearly demonstrated in Governance of Financial Supervisors and its Effects – A Stocktaking Exercise by Marc Quintyn http://ideas.repec.org/b/erf/erfstu/47.html. The protection of fundamental human rights was a foundation stone in the establishment of the United States over 200 years ago. Since then, a central goal of U.S. foreign policy has been the promotion of respect for human rights, as embodied in the Universal Declaration of Human Rights. The United States understands that the existence of human rights helps secure the peace, deter aggression, promote the rule of law, combat crime and corruption, strengthen democracies, and prevent humanitarian crises. Coordinate human rights activities with important allies, including the EU, and regional organizations. DRL takes consistent positions concerning past, present, and future abuses. With regard to past abuses, it actively promotes accountability. We are dedicated to combating both overt and subtle forms of racism and discrimination internationally. The United States is party to the International Covenant on the Elimination of All Forms of Racial Discrimination, and is committed to seeing the goals of this covenant fully realized. Particular emphasis should be placed not only on eliminating any remaining legal barriers to equality, but also on confronting the reality of continuing discrimination and inequality within institutions and societies. Our treaties are critical to protecting U.S. sovereign interests… facilitate our businesses’ international economic relationships. The Department of State will employ various mechanisms to ensure a coordinated process for enhanced intra- and inter-agency coordination on addressing gender-based violence. The mechanisms outlined below mirror the framework detailed in the Secretary’s Policy Guidance on Promoting Gender Equality, and will be integrated across existing coordinating bodies on gender issues, both in Washington and within embassies and missions. Request that relevant regional bureaus and embassies include specific gender-based violence issues within their strategic plans, as applicable to specific country or regional contexts. Embassies and bureaus will strive to ensure that the full range of U.S. policy and assistance programming identifies and addresses existing gender disparities, capitalizes on the unique skills and contributions of women and girls, and is accessible and responsive to ongoing challenges confronted by women and girls. In order to further this agenda on issues specific to gender-based violence, the Department of State will: Establish an intra-agency working group, consisting of representatives from a wide range of bureaus and offices across the Department, to assist in internal coordination and integration of gender-based violence prevention and response in Department programming and policies. The working group will share information and establish priorities, as well as coordinate existing policies and programs to eliminate gaps and effectively maximize existing resources. Build off existing platforms (GHI, PEPFAR, etc.) and scale up programs that have been found effective, contingent on resources. This could include programs that integrate screening of and response to gender-based violence into health service delivery programs, as well as psychosocial support where feasible; or programs that require health and life skills programming for adolescent and pre-adolescent girls and boys, for example to address sexual coercion and abuse and promote elements of healthy relationships; Establish multi-sector linkages regarding violence prevention and response programs, with particular attention to the legal/judicial system and the education and economic sectors; and Address the causes, including root causes, of gender-based violence, especially violence against women and girls. This includes reducing barriers between women and men and girls and boys in economic, political, and civic arenas and implementing initiatives that protect human rights and raise societies’ respect and value for all women and girls, including inclusive education and economic empowerment opportunities.